Sorry, can't see what happend, but my link is obviously of no use. Try searching with ITA multi-city; Flight 1 Dep LAX Arr PHL Flight 2 Dep PHL route CLT RDU DCA Arr MCO. Flight 3 Dep MCO route MIA Arr PTY. Then add on the flights from your previous search. On my phone now so can't copy/paste/link. I have a 30min connection at CLT, as well as a 40min connection at JAX - if I miss either of those, the entire trip would need a massive work around! Still, I'm almost hoping for it, so I can have the ORC, and get some proper sleep! Haven't done JAX, but CLT is doable in 30min if not late incoming (I presume that's from LAX?) Connecting at SFO is rather easy, but not much time for entertainment. The CLT one is connecting RDU-CLT-JAX-MIA-PTY on the way there; so any delay, would screw up the outbound entirely (and likely mess up the overnight, which would ruin the return). The JAX is MIA-JAX-CLT-RDU for an overnight at RDU - so again, any delay would severely mess me up! Ohh so much to look forward to! I'm in PTY from 20:36 - 07:00 so I may try and grab something to eat somewhere. Thanks! That's a bit reassuring. By any chance, did you write about your ORC experience & procedure in the ORC thread? I never had to deal with it so I am quite ignorant on how request it, and by who. Any ORC claim you have would be made to BAEC. They then contact AA (or whoever the marketing airline was) and work out if you are due something. As long as it gets approved you'll then see BA reverse off from your account the re-routed flights, and credit for the originally booked flights. Slightly OT. I have booked the PTY TR and following the recent AA schedule, the current routing is very different to what was originally booked. In the event of IROPS,, would ORC apply to the original ticket or the current re-issued ticket? My last PTY stays have been in El Cangrejo area, where there are three medium/low priced hotels in the Hilton family, DT, HGI and HI (no experience of the latter). A major reason to stay here is the short distance (walking is fine after sitting in planes) to good seafood. Actually 4 out of the 5 highest ranked seafood restaurants on TA are in the proximity: Siete Mares (my fav), Casa Marisco, Puntarenas and Machu Picchu. MP with a Peruvian style unsurprisingly have a large selection of ceviches. Even staying elswhere, Uber works fine in PTY. I think your ORC would relate to your rebooked route rather than the originally booked route in teh event of on the day IRROPS - however this is very much a gut feeling rather than based on experience. I'm YYZ based and need to be in London on the 4th August, plus a little bit of time either side for leisure purposes (which is very flexible). I need my four qualifying flights, and ideally enough TPs to requalify for Silver or close to it (currently at 70TPs, and year end is December). 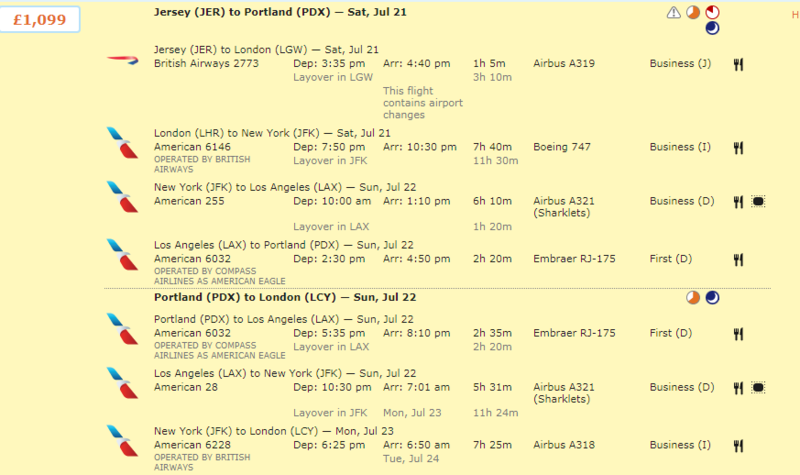 Icelandair have a CAD 2,000 J fare YYZ-LHR/LGW which is very hard to ignore. The other carriers are CAD 4,000 and higher. Can be worked for both BA2 and A321T from my below example (I am just looking at a weekend run), however I can't seem to force it to give me the JER-LGW sector on a Friday evening and start out from LHR earlier on the Saturday to enable a night stop in PDX, anybody have any luck on that front? Sorry for the off topic question, but when I try ITA Matrix to plan my own version of the above itinerary, it limits me to 6 flights. How did Pilot37 get 7 flights? Is there a premium version of the site or was this done using a different tool? Thanks in advance. I did a Multi-Sector search with JER-PDX in the To/From fields of the first box and PDX-LCY, in this example, in the 2nd box. Then select Advanced Controls (I think that is what it is called) and in the boxes that appear, on the left hand ones I placed LON JFK LAX (1st box) and LAX JFK (2nd box). This avoids creating the itinerary via separate flights between each airport and advises ITA Matrix that you want to go from JER to PDX via LON JFK and LAX. If you put comma’s between those Cities it would ask the system to route you from JER to PDX with a stop in either LON, JFK or LAX. There are much better teachers out there then myself on ITA Matrix, but hopefully that helps you in your search.